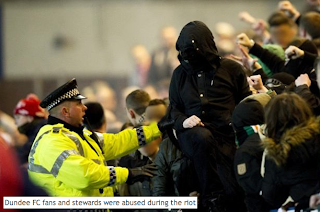 If You Know Their History: Celtic fans disturbances "like a throwback to the 1970s"
Celtic fans disturbances "like a throwback to the 1970s"
CELTIC chiefs yesterday apologised to Dundee FC for the drunken behaviour of some fans at the Boxing Day game at Dens Park. Chief executive Peter Lawwell vowed to work with the Tayside club to identify any supporters involved in the disorder. It followed angry comments from Dundee’s operations chief, who described the scenes as the worst he had seen “in 20 years” and a “throwback to the 70s”. Parkhead bosses said yesterday they had been contacted by their own supporters to complain about the behaviour of fellow fans. The worst trouble took place in the Bob Shankly Stand, which housed 3000 Celtic supporters. Jim Thomson, Dundee operations manager, said: “I have never seen anything like the behaviour of the Celtic fans in the 20 years I have been running games at Dens Park. Thomson said home fans and stewards were abused and Celtic fans fought among themselves. Thomson blamed the late kick-off for the game, which was screened live on ESPN. Lawwell said: “We are very proud that Celtic supporters enjoy such a great reputation and it is therefore extremely disappointing that the behaviour of a small minority has tarnished the good name of the club and our fans in this way. “Clearly, we apologise to Dundee. We will work with them and look into any incident raised, and if we can identify any individuals involved, we will take the strongest possible action. Police said there was “a level of disturbance at the match, primarily within the Celtic section”. One Dundee supporter and four Celtic fans will be reported to prosecutors for alleged offences.